The Islamic Screen Saver contains lots of Islamic images and over 120 Islamic saying. Two versions are available here for download - a version optimised for 800x600 screen resolution and a version optimised for 1024x768 (note that both versions will work in all screen resolutions including 640x480). Windows 95 is required. The price is £5 (UK pounds sterling). All the money will go towards saving Baqir. Baqir's life depends upon your generous donations. For non-UK payment please send equivalent cash as it costs more than £5 to convert a foreign currency cheque to UK £. Please note that Innovative Minds is not in any way linked to World Wide Welfare, we are simply helping them on this project - dont send your money to us. 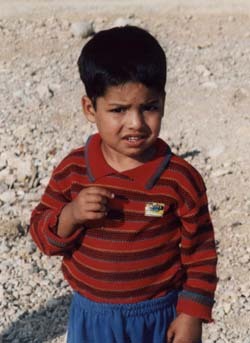 Baqir, an Iraqi refugee is just under 2 years old. Born in a refugee camp, he is now living with his parents in Servistan camp near Shiraz, in Iran. 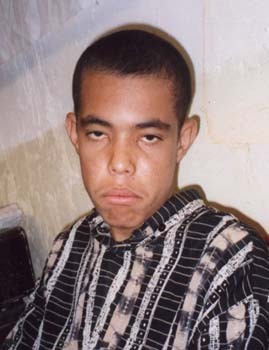 He suffers from a blood disease called B-Thalassaemia Major. 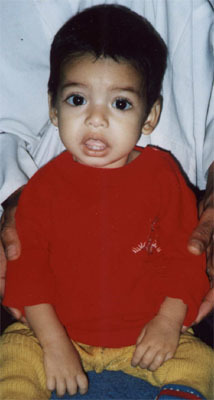 In order to stay alive Baqir needs a blood transfusion every 20 days. He is anaemic and weak. The cost to his family for a pint of blood and staying in a hospital is £22.20. His father does not have an income. 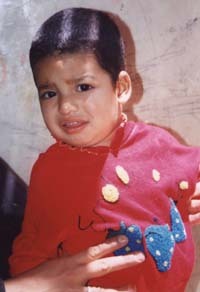 Sometimes Baqir has to miss his blood transfusion because his father does not have the money to take him to hospital. Most of the time Baqir's father has to borrow money to help him. If Baqir is to stay alive he needs an operation to remove his spleen, this costs £3500. He would then still need medication for all his life. Another hope to save his life is a bone marrow transplant. This type of operation can only be done in the west. Your support to help save Baqir's life will be rewarded from Almighty Allah. Please help generously. Baqirs general health has improved now due to regular blood transfusions and a better diet. Dr. Bayan is currently in the refugee camps in Iran and is expected to bring further report about Baqir's progress upon her return to England. Spleenectomy will not take place as this will be prone to infection due to weakened immune system, making him more susceptible to diseases. Bone marrow transplantation will be required. Dr. Bayan has enquired at some childrens hospitals specialised in this field of treatment and it has come to her attention that bone marrow transplant in England can only be done to children aged 5 and over: Baqir is 2. Money rasied as of 7th May 1999 is £3600. This money will be divided. A portion will go towards Baqirs continued treatment, he required a blood transfusion every 20 days, and healthy diet (high iron foods). The remaining will go towards a fund to pay for his bone marrow transplant in three years time. This decison will be confirmed when Dr. Bayan returns to England back from the camps. Lets pray that Baqir is able to survive with just the blood transfusions till the age of 5 so that a bone marrow transplant can take place to give him a healthy life with his parents. Ameen. NOTE: Some people have rightly asked whether 100% of the money goes to Baqir or are there any expenses. Please rest assured that every penny collected goes towards Baqir. The expenses Dr.Bayan incures in visiting the refugee camps, etc. are NOT paid from the Baqir fund. Baqir is now living in Serwistan Camp in Shiraz in Iran .Baqir and his family moved to a new housing unit inside the camp and he is living happily with his two siblings. Baqir now is three years old boy. Dr. Bayan visited him recently in May 99 and she found that his heath had improved a lot. He had put on weight and he has started to walk and his appetite has improved a lot. His Haemoglobin has improved with in normal range. Blood transfusion every two weeks or whenever his Haemoglobin is low. Specialist doctor had advised Dr. Bayan that Baqir should continue this line of treatment until the age of six years then he could have his condition assessed in the UK. After that the doctors will decide what they will do. The newest treatment for this case is bone marrow transplant. 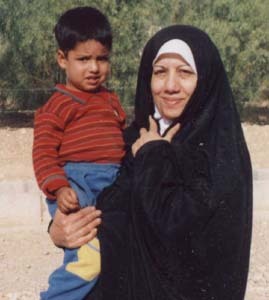 Dr Bayan has visited the camps 10 times; in her latest visit she managed to visit 12 different camps! There are similar cases in other Iraqi refugee camps and it is planned that the scope of this project should be extended to help these children as well as Baqir. 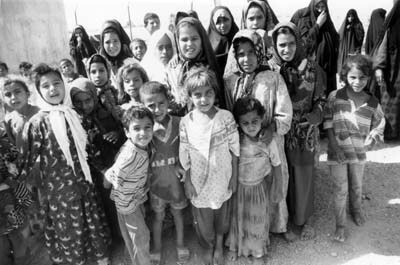 Dr. Bayan Alaraji visited the Iraqi refugee camps in Iran recently. She came back by the end of September 2001. This was her 13th visit to the camps. During her visit she managed to visit some of the camps. Also she met Baqir and other children with B-thalassaemia. These children are benefiting from the Baqir fund, where they are getting the treatment available, such as blood transfusion, better food, and medical equipment, such as a pump to maintain the level of haemoglobin between 10 and 12 g/dl. We bought 7 pumps for 7 children so that each child has his own equipment. Baqir is doing well up to now because we detected his condition early and your generous donations to help him and other children made a big difference. Without your donation, Baqir will not make good progress. Baqir is now over five years old, he is growing well, and he looks like a normal boy. (The pictures are a little old and show him aged four). Very soon we will have to consider another line of treatment. Bone marrow transplantation from an HLA identical sibling donor offers the only hope of long-term survival. Otherwise transfusion is the only mainstay in the management of such condition and maintaining if possible the haemoglobin levels as mentioned above. Bone marrow transplant is a sophisticated and delicate operation, not available there, and should be done in the West to get the best results. I hope Baqir will have the opportunity to come to the UK for this treatment, and this depends on the amount of donation collected to help Baqir and other children. Until now we managed to collect £4631.27. As you know some of that money was utilised to pay for hospitalisation, blood transfusion, medical equipment and food supplements for him and the other children. It is worth mentioning that Baqir is an Iraqi refugee, lived a camp as long as he remembered, and neither him nor his father have a passport or a legal document to travel with; so we have to find a legal way to bring him to the UK. Please if you have any suggestion regarding this matter, do not hesitate to write to me. 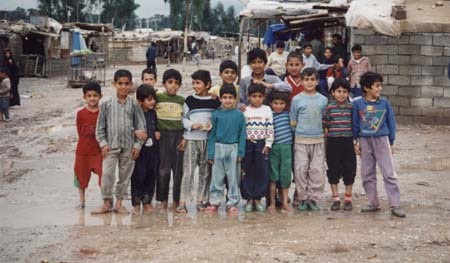 I am planning to visit the Iraqi refugee camps in Iran during this spring if I have the resources. By then I hope that I will have more information about Baqir and the other children. 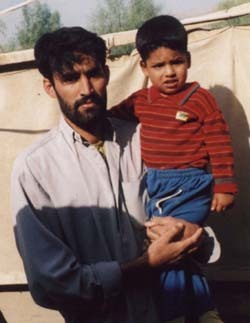 Meanwhile I leave with some lovely photographs of myself carrying Baqir and another photo, with his father carrying him. Also two photos of a girl and of a boy with the same condition. 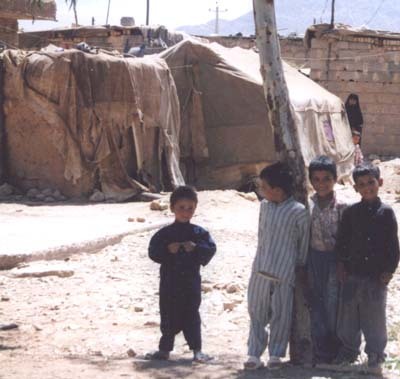 The other photos show a view of the camp where Baqir and other refugees are living in Serwestan camp, Shiraz province in Iran. Let us bring hope to these children. Baqir is living with his parents, brother and sister in Serwestan camp in Shiraz province in Iran. The number of refugees in Serwestan camp is 2356 (the latest figure), about one third of them are living in basic brickwork houses which compose of two small rooms, kitchen and bathing area, and basic toilet facility. Each housing unit has a tap of running water. The other two thirds are living either in tents or in prefabricated housing units consisting of two compartment and the toilet and bathing facilities are shared. There is a school in the camp where boys and girls attend the school at different times. Also there is a very small nursery which accommodate only 50-60 children with very basic facilities. The children are always in need of clothes, shoes and stationaries which is not supplied by the camp. 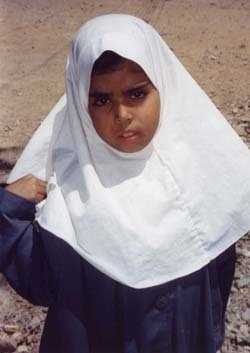 sometimes children are ashamed to go to school because they do not have proper clothing or footwear. There is a medical clinic which provide primary health care for the inhabitants. Patients who require hospitalisation or operation should pay fees. Most of the refugees do not have regular income, they have to sell some of their belonging such as selling a blanket in summer or selling a fan in winter, or selling a little bit of rice or flour for cash so that they can have basic medical treatment. 1. To relieve poverty, distress or suffering (including starvation, sickness or any physical disability or affliction) by appropriate charitable assistance whether medical rehabilitation, financial or otherwise in any part of the world. 2. To promote education by appropriate charitable assistance, including the establishment, maintenance and development of schools, training centres or any educational establishments. 3. To assist in the preservation, conservation and protection of the natural environment for the public benefit in any part of the world. The areas of operation include the Iraq-Iran border (Iraqi refugees), Kosovo (Kosovan refugees), Afghanistan and Palestine. 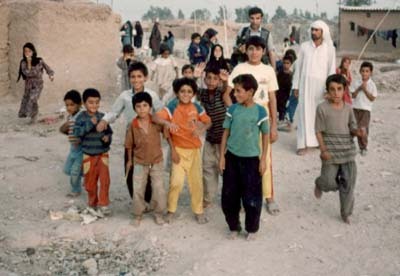 According to UNHCR (United Nations High Commission for Refugees) reports, there are 550,000 Iraqi refugees living in the Islamic Republic of Iran, of which 88,000 of them are living in the camps near the border with Iraq. The rest are scattered all over cities in Iran, mainly in Tehran, Qom, Mashad and Ahwaz. The Iraqi refugees who are living in the camps receive help from the Iranian government, the UNHCR and other organisations, but it is not enough. Those refugees who are living outside the camps receive very little help from local charities. These Iraqi refugees who were forced to leave their country are in desperate need of your help; they are literally forgotten, and not even included in the UN resolution Oil-for-food programme. Your regular contribution will enable World Wide Welfare to provide food and basic health needs and care for the vulnerable groups: the children (under 15) who constitute 53-57% of the population of most camps, the elderly and the disabled, the orphans and widows. The UNHCR and WFP distribute flour, rice, cooking oil and pulses, in quantities to keep the refugees alive. No meat, vegetables or fruites is available free for the refugees, only for those who can afford it. Sometimes the distribution of food is delayed for one reason or another, then the refugees have to suffer. In these circumstances we have to act immediately to distribute rice and cooking oil as you can see in one of the photos. Orphans sponsorship project, if you donate £15.00 a month this can provide better food, clothes and medical treatment for a child. Imagine a child at the age of 10 losing their childhood. This a reality for Rasheed, who has to look after his two younger brothers because both of their parents have died. When you sponsor a child like Rasheed, you will allow them to retain their childhood and give them a brighter future. Poor families sponsorship, i.e. families with no bread winner among them need help and support. For example if you donate £20.00 a month for a family of 5, this will provide better food, health and clothing for all the family. Medical assistance project, to help people who cannot afford fees for going into the hospital to have an operation. For example we already have Baqir fund to help children with Congenital blood diseases such as Thallasaemia and Sickle cell anaemia. Also we have a project to restore sight for old people who are blind because of cataract. If you donate £80.00 you will change the life of a blind man or woman and make them independant and able to see. You can donate any amount of money toward this project or any other project. 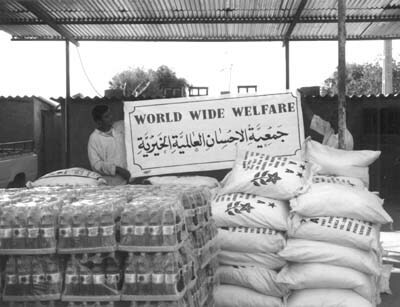 Distribution of meat and vegetables to the refugees, for example if you donate £40.00 to buy a sheep we could distribute the meat to 20 families who cannot otherwise afford to buy meat. Sponsorship of a disabled person in the camp, for example if you donate £10.00 per month to a disabled person, you will definately improve his or her life. Financing microprojects to help the refugees helping themselves, for example, if you donate £5.00 towards buying chicks for a familly , so that when they grow up the chickens will produce eggs which they could sell for cash. Or buying a sewing machine to a woman refugee for £40.00, then she could make dresses and sell them for cash. These are some of the activitees and projects of WWW, Although we are a small charity, but we are making an impact on the general condition of the refugees in the camps. We are planning to expand our area of operation to include Burundi when we find the right contacts there. 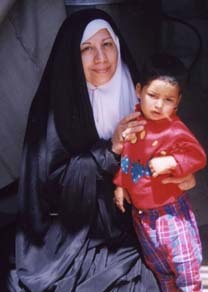 We have also managed to send some help to Kosovo and Afghanistan, and have made donations for helping the Palestinian orphans and a number of refugees in Indonesia. During the last few years we had tremendous response from people in different parts of the world and also from home (UK) where few ladies have offered their wedding ring and pieces of their jewellary to Baqir fund. A big thank you to all of you who supported the needy through World Wide Welfare.